Along with these new releases, the talented SHARON HARNIST, has joined on as a Guest Designer for Flourishes. 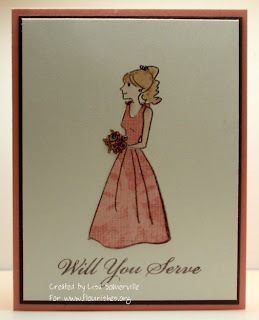 You can enter to win TWO Flourishes stamps sets of your choice just for uploading any card to the SCS gallery that is done with Flourishes images. Be sure to read this thread for more details. Good Luck! Here's a few samples I did for the new releases, you can see more new release samples here, along with many other Flourishes samples. These open images from the Wedding Party set are great for using the Paper Piecing Technique. Here, I stamped and embossed the image in chocolate on shimmer card stock. Then stamped and embossed the image again on Afternoon Tea Designer Paper, cut it out and adhered it to my image on the shimmer card stock. I used markers to add color to my bridesmaid and flower bouquet. The sentiment is from the set Wedding Essentials and is stamped in Chocolate Chip. The main image is layered on Chocolate Chip, then a Groovy Guava base. Here's another card I created that features the Wedding Essentials and Wedding Party sets. The main image is stamped in Black Archival Ink from Ranger on shimmer card stock and heat set, then colored with markers. I used the Stardust Gelly Roll Pen to add a bit of shimmer to the brides dress. 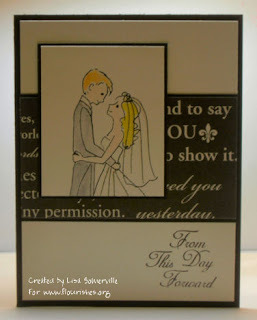 The designer paper under the couple is by Teresa Collins . 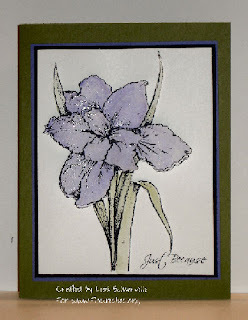 On this last card I used the beautiful Siberian Iris set. To add dimension and lift to my Iris, I used the Paper Tole Technique (06/03 TJNL). I stamped my images in Black Archival Ink , heat set and water colored them in Lavender and Artichoke. I used the Stardust Gelly Roll Pen to add a bit of glitter to the Iris.